Ever since Samsung demonstrated a device with a wrap-around screen at the Consumer Electronics Show in Las Vegas, in January of 2013, there have been nearly continuous rumors that the next device from Samsung would use this technology. When that didn’t happen, it was the “next” device. Early in the rumor cycle for the Note 4 we saw frequent mentions that there would be two versions of the Note 4, one with a regular screen and one with a curved screen. Sometimes curved screen was interpreted to mean a wrap-around, like that demoed at CES, sometimes a curved screen like that on the Samsung Galaxy Round. But over the last couple of months, rumors of this second version of the Note 4 seemed to fade away. At best, sources seemed to think it might be announced later this year, or in 2015. Maybe that’s because this isn’t technically a Note 4. It’s the Note Edge. And it was quite a surprise when shown for the first time at Samsung Unpacked today. With the exception of the screen, and the special software to make use of it, and the case design, the Note Edge is very much a Note 4. The same processor, the same GPU, the same battery, and the same amount of RAM. Both will ship with KitKat 4.4.4, and have the same S-Pen and same suite of pen-based apps. The Note Edge, however, will be offered with both 32GB and 64 GB storage options, where the Note 4, at least for now, comes in only a 32 GB edition. 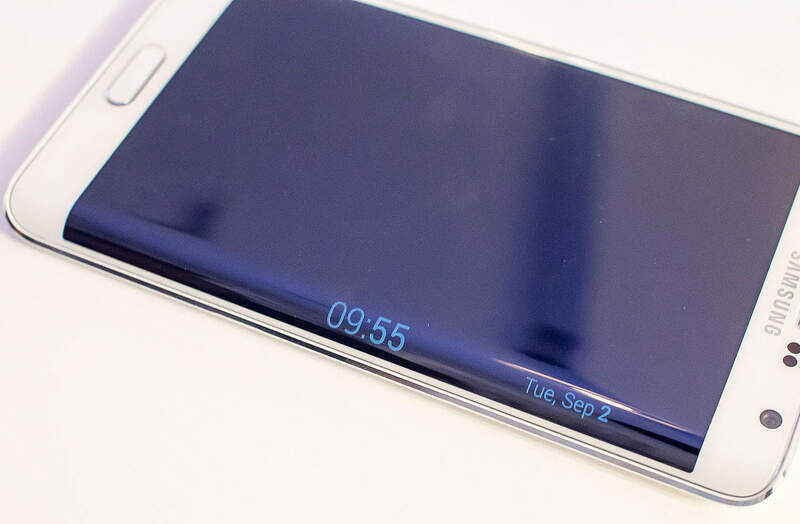 The body of the Note Edge forgoes the metal construction of the Note 4 (and Galaxy Alpha), and relies on Samsung’s traditional plastic construction. The real difference, of course, is in the screen. The main screen offers the same QuadHD resolution of the Note 4, but Samsung describes it as a 5.6″ screen, rather than 5.7 inches. Comparing the two, you can see that the main screen actually appears slightly narrower than on the Note 4. Then there’s the curved portion, which adds another 2560 x 160 pixels of display area. Samsung describes the display as 2560x1440x160. Samsung provides a bevy of software apps to take advantage of the novel screen real estate (which Samsung calls the Edge Screen), and has developed a software API for developers to create additional apps and capabilities. The default display is the App Launcher, which takes the place of the application dock on normal Android phones, freeing up that screen space for other uses(although I notice the icon for the App Drawer is still on the main screen, instead of the Edge Screen where I would place it. One interesting feature is that the phone can be configure to display notifications on the Edge Display without turning on the main screen. If you get lots of notifications, this has the potential to save some battery life. The Edge is slightly wider than the regular Note 4, but also slightly shorter and thinner. The device will apparently be available on all four of the major US carriers later this year. No word on price, but we expect it will be at least $100 more than the Note 4. Samsung also showed a flip case for the phone that leaves the edge screen exposed, allowing it to display status information while the main screen stays covered and turned off. Until we can get our hands on one, the Edge Screen raises more questions than it answers. How easy will it be to hold without accidentally activating the Edge Screen? What use will 3rd party developers make of it? Will it be really useful, or just a gimmick. Wat do you think of the Edge Screen? Will it offer enough functionality, or novelty, to justify the price difference? If nothing else, Samsung has made a statement. It has a product no one else can offer, and that differentiates it from all the other Android phones and phablets. The markets have certainly taken notice, as Apple’s stock price fell after Samsung’s announcement this morning.